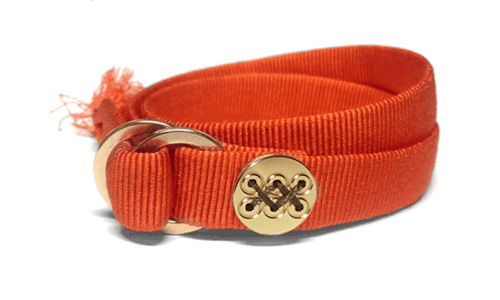 The Samurai Cord Tangerine Double Silk Bracelet is made from traditional woven cord known as Sanadahimo, from the 16th century. Crafted in the spirit of the original designer, Sanada Yukimura, who is immortalized in Japan as the Number One Samurai. It was first used as a wrapping for the hilt of the samurai sword. As you can see it is a very strong cord. The hand sewn Rokumonsen “The Six Coins” is his primary family crest that was used in every battle. Our creation is to be worn as an amulet for those who live their lives to the fullest, in the hope that people will tie meaningful bonds when shared with others. 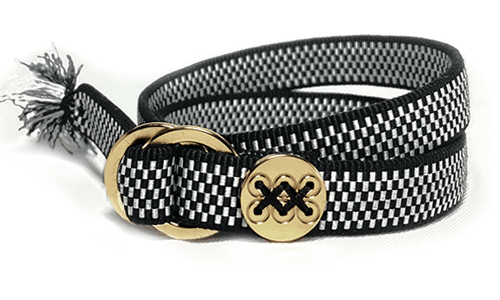 Samurai Ribbon is made from Japan’s traditional woven craft, known as “Sanadahimo“. This technique of weaving started in Japan around the 9th century. In the beginning, this ribbon was unamed until the 16th century by a well known legendary Samurai named “Sanada Yukimura“ . He developed his own techniques of weaving the ribbon for the primary use of improving a sword’s functionality by wrapping the handle. It was also used to fasten armor, helmets, and items of importance (on their waist) securely for combat. This resilent woven textile is proven in durability, which is extended into present day conventional uses. Since then, (Sengoku period) people have called this ribbon “Sanada Himo”. Many other Samurai adapted Yukimura’s style for themselves by making their own pattern of ribbon for each family crest as a decorative identifying mark. It is highly prized in history as a collection of their mementos. Currently this Sanada-Himo is utilized in many different ways. A modern usage is to tie the outer portion of a wooden box, which contains a high quality tea bowl, for the “sado” tea ceremony. Each tea ceremony, adorns a style of ribbon called “Yakusokuhimo“, known as a “Promise Bond”. Each artisian, crafts the woven handle which can only be used exclusively by the organization representing their Sanadahimo. It is also known as a Obijime, a decorated sash used to tie an obi firmly to a Kimono. 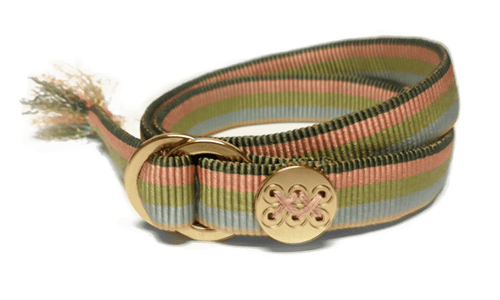 I have collaborated this woven ribbon interpetation with the “SANADA” family crest, refered to as “Rokumonsen” (六文銭), which translates as the “Six Coins Crest”, which the Sanada Family only used in every military campaign during their era. The crest(flags) bore six painted gold coins, draped from red banners. Each individual warrior would place six coins(rokumonsen) on a piece of string that they wore around their neck as a symbol to mentally and spiritually “brace” themselves for battle. The Sanada family are popularly remembered for their six coin crest. It was believed that the spirits of warriors needed to pay a toll before boarding the river set for the afterlife. These six coins were made to pay for one of the six paths revered in the Buddhist afterlife. It was made to insure a “pure” passage for the wearer’s spirit. According to legend, this particular crest was used whenever the clan entered battle. My impression of the observance of the six coin crest meaning is that, when they entered into battle they were preparing themselves to pay the ultimate sacrifice. 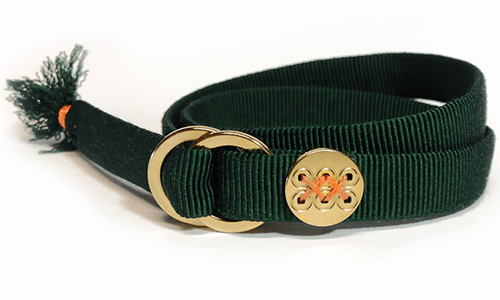 However, I have designed the “Samurai Ribbon Bracelet” not because I believe in war or competition with others, but I believe the true conflict is within ourselves. My motivation for this bracelet is to remind ourselves to empower our fight for internal battles. I created this “Samurai Ribbon Bracelet” to be worn as a product of charm and blessing for those people who live their lives to the fullest. Also is the hope people will tie meaningful bonds with many others. This strong bond repesents the strength of the “SANADAHIMO“.